Once the pod has been landed on timber blocks the landing platform we position the pod skates in suitable locations to support the pod. The pods movement is controlled using pod skates with handles when moving off the landing platform and traversing to the final position. The pod will then be raised off the blocks using the hydraulic jacks. Once each corner of the pod is clear of the landing deck the lift supervisor gives the instruction to move the pod accordingly off the landing deck. The pods are then be traversed to the final position with one operative positioned on each corner to ensure the pod moves in the required direction. 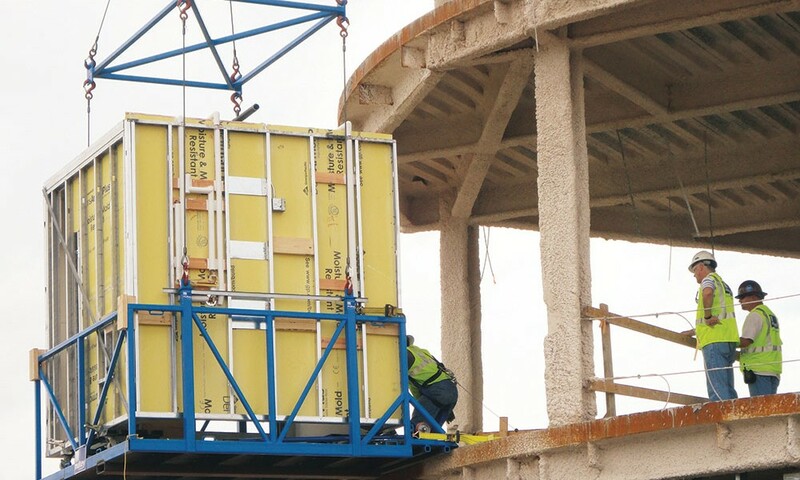 The acoustic barrier are then positioned in the relevant locations and the correct number of shims to level the pod previously marked on the floor. The pod is then positioned over the acoustic barrier and shims then lowered down off the pod skates. To final position the pods will be moved to is position with 800mm clearance around the pod using the pod skates.